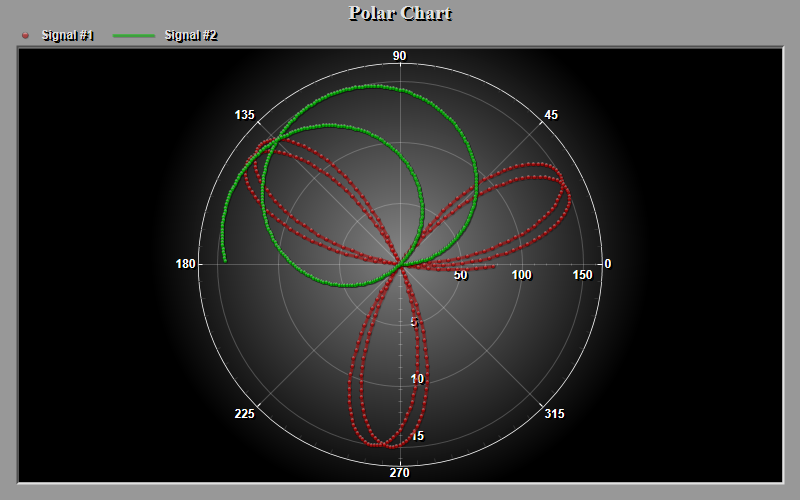 The Polar Chart Control is similar to the Scientific Graph in that the developer uses data-sets containing both y and x axis components. Each data-point is assigned its own independent x and y value. See YData and XData. See example 200 within demo to learn how to create a simple polar chart. There is no horizontal scrolling, however, the Polar Chart, Smith Chart, and Rose Chart components support zooming with a high level of detail in grid line restructuring to best fit the shape and amount of zoom. 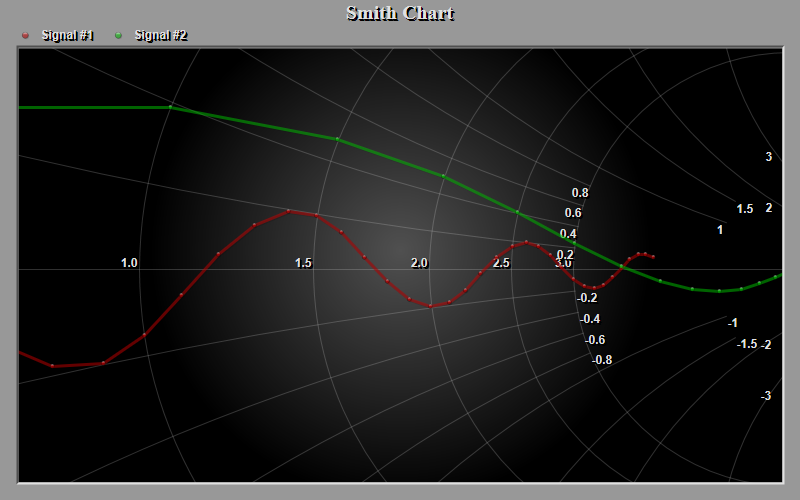 Like the Graph and Scientific Graph, the Polar Chart and Smith Chart supports graph annotations. Also, like the Graph and Scientific Graph, multiple axes are included. One at 3 o'clock, the other at 6 o'clock. Within the demo, see example 202. Also supported is cursor tracking. This features shows the graph coordinates/data-point value for the location of the mouse cursor. As the user moves the mouse over the graph/data-points, the corresponding graph coordinates are displayed in the top-left corner of the control. See CursorPromptTracking. The Graph and Scientific Graph also support this feature. 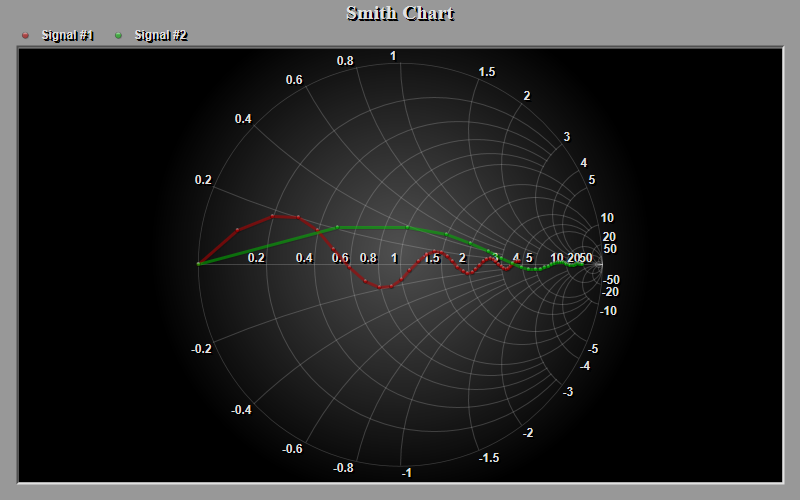 The Smith Chart Control is used primarily by Electrical Engineers. Its designed to plot real and imaginary components of circuit and cable characteristics. The Admittance Chart is also possible. Within demo, see example 203. 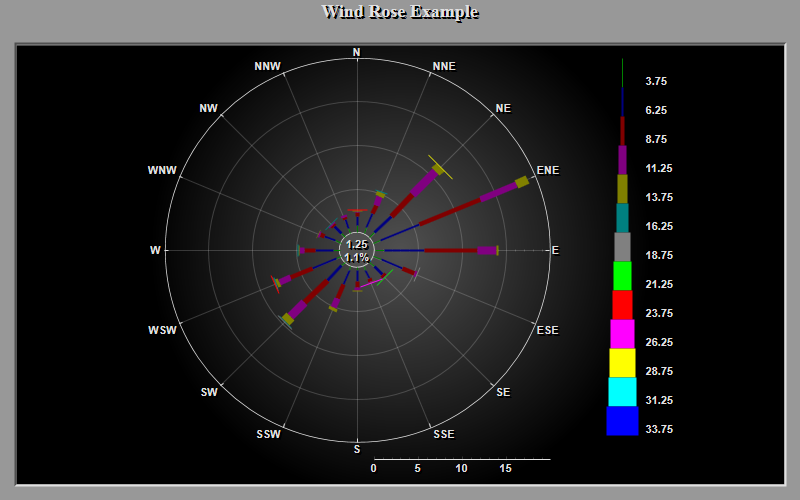 The Rose Chart - Rose Plot is a combination of a polar chart and a histogram. It plots the frequency or percentage of occurrences data shows up at a particular angle or direction. Mostly used to help visualize cumulative wind direction or wave direction data but also used anytime you need to show a histogram related to direction. Within demo, see example 204.